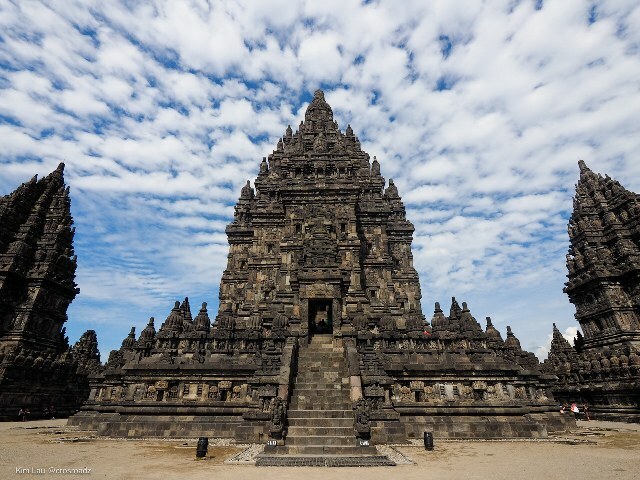 Prambanan Temple, also known as Candi Rara Jonggrang is an extraordinarily beautiful building constructed in the tenth century during the reigns of two kings namely Rakai Pikatan and Rakai Balitung. Visiting this temple in the afternoon for sunset is a big fun and peacefulness. 2.0.1 WHERE IS PRAMBANAN TEMPLE? More less a century Java land controlled by the buddhist dynasty syailendra or sailendra dynasty. But their power faded after a few major defeats and slowly collapsed. And the history of prambanan temple began at that time. Sanjaya dynasty that was Hindu slowly and surely began controled the Java region. And to compete with Borobudur temple which is the largest Buddhist temple located in Java ever built by dynasty syailendra, then dynasty sanjaya built a hindu temple that is not less magnificent. The construction of prambanan temple was first started around 850 AD by rakai pikatan and continuously perfected and expanded by king lokapala and king balitung maha sambu. This sacred building was built to glorify the god Shiva, and the original name of this building in Sanskrit is Siwagrha ( Sanskrit: Shiva-grha which means: Shiva’s house ) or Siwalaya ( Sanskrit: Shiva-laya meaning: Shiva sphere or Nature of Shiva ). In this inscription mentioned that when the construction of prambanan temple or “siwagrha” was underway, also done the general work of changing the water in order to move the river flow near this temple. The river means is Opak river that flows from north to south along the west side of the prambanan temple complex. The history of Prambann temple ended Around 930s, the royal capital was moved to East Java by Mpu Sindok who found Wangsa Isyana. It is believed that Mount Merapi eruption which is located about 20 kilometers north of Prambanan temple couse the royal centre moved to east java. And other causes were rebellion and power struggle within the dynasty itself. After the displacement of the capital, Prambanan temple began to be neglected and unkempt, so slowly this temple began to break and collapse. This temple is estimated collapsed because of the great earthquake of the 16th century and finally Prambanan temple became hundred of a small debris. Although no longer a as religious center and worship of Hindus, the local people around were very respectful of the ruins of prambanan temple. In 1733, this temple was discovered by CA. Lons a Dutch national. This temple attracted the world’s attention during the British occupation in Java. At that time Colin Mackenzie, a subordinate surveyor of Sir Thomas Stamford Raffles, discovered this temple. Although Thomas ordered for further investigation, the ruins of this temple remained displaced for decades. The restoration began in 1918, but serious effort began in the 1930s. Until 1942 and then handed over the leadership of the renovation to Indonesian and it continued until 1993. Continuous renovation effort carried out until now. The restoration of Shiva temple as main temple of this complex was completed in 1953 and inaugurated by the first President of the Republic of Indonesia Sukarno. At that time the local people ( javanese ) around the temple already know the existence of this temple. But they didn’t know the true historical background, who is the king and what kingdom has built this monument. As a result of the imagination, local people create local folklore to explain the origin of the existence of these temples; Colored with a fantastic story about a giant king, thousands of temples built by the spirits of the genie in just one night, as well as the beautiful princess who was cursed into a statue. The legend of Prambanan is known as Rara Jonggrang. Ramayana Ballet in Prambanan Temple is a colossal dance performance without dialogue that is held regularly in the courtyard of Prambanan Temple, Sleman Yogyakarta. In this show tells the story of Ramayanan which create by Walmiki taken from legendary story written in Sanskrit. The story is also a description and translation of prambanan temple relief. When you visit Prambanan Temple in the afternoon, do not rush away. The beauty of Prambanan Temple in the afternoon will offer a view of sunset among the main temples. Amazing! You will feel the serenity and peacefulness when looking at the sunset here. The atmosphere of silence and sacred will make you fascinated and amazed. Inside the temple area filled with tourists that take picture and enjoy the beauty of Prambanan temple when the sun began to sink. Because this largest Hindu temple in Indonesia can turn into a very exotic with the sunshine of the afternoon sun. Prambanan Temple or Loro Jonggrang Temple is a hindu temple which is located on the border between two provinces namely Central Java and Yogyakarta special region. The location of prambann temple precisely approximately 30 km east of Yogyakarta city. This temple is dedicated to Trimurti, the three major Hindu gods of Brahma as the creator god, Vishnu as the nurturing deity, and Shiva as the god of destruction. In garbagriha (main room) this temple residing statue of Shiva Mahadewa as high as three meter which indicate that Shiva is preferred in this temple . Today, this temple belongs to a UNESCO protected World Heritage Site, this title was awarded by UNESCO in 1991 and also defined as one of the most beautiful hindu temples in Southeast Asia. The architecture of this building is tall and slender in accordance to the Hindu architecture in general with the Shiva temple as the main temple has a height reaching 47 meters looming in the middle of a smaller temples in that complexes. As one of the grandest temples in Southeast Asia, Prambanan temple attracts tourists from all over the world because of its beauty. Address: Prambanan, Bokoharjo, Klaten, Central Java, Indonesia. Private car tour is included: Car, an english speaking driver, fuel, Prambanan Temple entrance fee, parking, mineral water, local guide and transfer back to your hotel. Start From Giwangan Bus Station: Firstly you can take Trans Jogja with route ( 3A ) and stop in Airport shelter, then please take route ( 1A ) and stop in Prambanan shelter, then please take a walk to Prambanan Temple. Start From Adisucipto Airport: Firstly you can take Trans Jogja with route ( 1A ) and stop in Prambanan shelter, then please take a walk to Prambanan Temple. Start From Tugu Railway Station: Firstly you can take Trans Jogja with route ( 1A ) and stop in Prambanan shelter, then please take a walk to Prambanan Temple. IDR 337.500 /person for adult. IDR 540.000 /person for adult. IDR 405.000 /person for children & student by show Passport or student card at the locket. *The price only for International visitor not for local. IDR 20k for Tandem bicycle. ( Souvenirs Shops, Information Office, Museums (free), Official Local Guide Service, Audio Visual Documentary, Restaurant, Wheel Chair. Free coffee/Tea or Mineral Water for International Visitors ).